On January 5, 2011, after months of heated public debate, the Israeli Knesset established a parliamentary committee of inquiry to probe foreign funding of Israeli nongovernmental organizations (NGOs) involved in the international Israel delegitimization campaign. Was this a draconian, McCarthyist encroachment on the freedom of press as claimed by left-wing groups and politicians, or a legitimate attempt by a besieged democracy to fend off hostile intervention in its internal affairs as argued by the legislation's proponents? Nor has this obsession been driven by humanitarian considerations. Not only is the Gaza Strip not in the throes of a deep crisis, but the humanitarian situation there is better than in some of the countries whose ships have been sent on occasion to break "the siege" of Gaza. Infant mortality in the Gaza Strip, for example, is 17.71 per thousand births compared to Turkey's 24.84 or the global average of 44; life expectancy in Turkey is 72.23 years whereas in Gaza it is 73.68, much higher than the global average of 66.12, not to mention such Arab or Islamic countries as Yemen (63.36), Sudan (52.52), or Somalia (50). Even by more advanced indicators, such as personal computer use or Internet access, Gazans are in a much better position than many of the world's inhabitants. In the words of the Slovenian philosopher Slavoj Žižek, no Israel-lover by any stretch of imagination, "an average Congolese citizen would probably have sold his mother into slavery to be able to move to the West Bank." The two-state solution—Israel plus a Palestinian state in most of the West Bank and the Gaza Strip with East Jerusalem as its capital—has long been identified by the majority of the international community, or at least by the West, as the key to Arab-Israeli peace. In these circumstances, one would expect the international community to help remove the main obstacles between the two sides by allaying Israel's security fears and by devising economic and demographic proposals for the resolution of the Palestinian refugee problem. Yet an examination of the international intervention in the conflict reveals a highly disturbing pattern: The greater the intervention, the more both sides harden, not moderate, their positions. Rather than facilitating peace and reconciliation, the international funds invested in the conflict have produced an organizational and ideological infrastructure that inhibits the chances for a future agreement. More specifically, the European Union as a whole and the European states individually finance a long list of associations dealing with the Palestinian-Israeli conflict that are part of a wider conglomerate seeking to perpetuate the conflict. The political discourse has fundamentally changed, and this is no longer the era of peace organizations but rather that of human rights organizations, many of which are deeply involved in protecting Palestinian "rights." Granted, there are Palestinian rights that deserve support and protection. But there are just as many false claims for rights that are designed to harm Israel and prevent reconciliation rather than improve the Palestinian condition. Foremost among them is "the right of return"—the standard Arab and Palestinian euphemism for Israel's destruction through demographic subversion. For example, in an internal meeting in March 2009, Palestinian Authority (PA) president Mahmoud Abbas acknowledged that the repatriation of even one million Palestinian refugees "would mean the end of Israel." In fact, there is no such right. It does not exist; nor has it been recognized or implemented on the political level, virtually anywhere in the world, and certainly not as a tool to destroy an existing nation-state. Only last year, the European Court of Human Rights ruled against a Greek demand for a "right to return" to the Turkish part of Cyprus stating that there is no such absolute right. But this does not prevent many groups from cultivating this destructive fantasy. For argument's sake, imagine that the international community convinces Israeli prime minister Benjamin Netanyahu and PA president Abbas to return to the negotiations table, and that news of an agreement leaks out. The broad contours of such an agreement would presumably be along the principles laid down by President Bill Clinton in December 2000 (about 95 percent of the West Bank given to the Palestinians with Israeli compensation in kind for annexed territories; Jerusalem partitioned on a demographic basis; no return of refugees to Israel with the problem solved by an international effort) or the not-so-different Ehud Olmert proposals at the 2007 Annapolis summit, most of which were apparently accepted by the Palestinian leadership in the ensuing negotiations. Would this breakthrough be welcomed by these NGOs? Hardly. A significant number of human rights groups will do precisely what they have been doing in previous years: They will conduct an international campaign against the agreement claiming it "fails to address the basic rights of the Palestinian people," first and foremost, the "right of return." These groups are part of a new empire—an empire comprised of official, international bodies such as the Human Rights Council of the United Nations in Geneva, the U.N. General Assembly, and the many "human rights" groups that voice a similar position. The automatic majority bloc of nondemocratic states in international bodies is a sad testament to the state of the world community; the identification of human rights organizations with this dark majority is a tragedy for world human rights. There is little discussion of the lack of human rights in such brutal dictatorships as Syria or Libya; but there is a disproportionate focus on Israel by these bodies, which in turn creates the false impression that Israel, and not such states as Sudan or Iran (or North Korea for that matter), is the foremost threat to world peace. The EU supports dozens of Israeli groups dealing with the conflict, but only a handful of these deal with the conflict's political dimension, notably the Israeli group Peace Now and the Israeli-Palestinian Geneva Initiative, both of which support the two-state solution. By contrast, there are numerous groups that, while paying lip service to the two-state solution, reject Israel's right to exist. Consider the Israeli-Arab groups Adalah and Mossawa—both of which are openly opposed to Israel's existence as a Jewish state—that is to its very existence—and support the "right of return." Or consider the Israeli Committee against House Demolitions, headed by Jeff Halper, who roams the world lambasting not only Israel but also "global capitalism." He has gone so far as to deride the 2002 Saudi peace proposal as an attempt "to placate the Arab street" and to accuse Arab leaders of seeking Israel's regional hegemony in order to tighten their grip over their oppressed masses. Furthermore, the Israeli Committee against House Demolitions publicly supports the "right of return" and the total boycotting of Israel. Yet this radical group is financed by the EU to the tune of €169,661 (US$232,198, for the years 2010-12). On the Palestinian side, the Dutch government funds the militant website The Electronic Intifada, whose cofounder Ali Abunimah considers PA president Abbas a "collaborator." Not surprisingly, Abunimah is fiercely opposed to the peace process, subscribing instead to the "one state solution"—the replacement of Israel by an Arab and Muslim state in which Jews would be reduced to a permanent minority as dhimmis, historically accorded a legally and socially inferior existence in Islam. Likewise, the Ramallah-based Palestinian group al-Haq receives support from the Swedish, Dutch, and Canadian governments, presumably to bolster its formal human rights agenda. Yet this organization is openly committed to the "right of return," as is the Ramallah-based, Palestinian-run NGO Development Center. Funded by the World Bank and a string of European states, including France, Sweden, Denmark, Switzerland, and the Netherlands, it disburses millions of dollars to Israeli and Palestinian associations, supposedly for the protection of human rights. But a glance at the list of the supported groups or their leaders readily reveals that most of them are also involved in political activism—including promotion of the "right of return"—and many of them support the anti-Israel boycott, divestment, and sanctions (BDS) movement. This hydra-like BDS is supported by dozens of different organizations. The EU or individual Western states do not directly finance the movement, yet they fund numerous groups that subsidize and support it. What makes this matter particularly galling is that the ultimate goal of the BDS movement is not just the end of the Israeli "occupation" of the West Bank and Gaza, but rather Israel's demise. The leaders and members of the BDS movement travel around the world and speak on human rights, democracy, and equality. But behind this lip service to universal values underlie the same extremist objectives preached by al-Qaeda, the Iranian ayatollahs, or Hamas: rejection of the two-state solution and castigation of any Israeli-Palestinian cooperation or Palestinian concessions for the sake of peace, as collaboration with one of the world's worst ever regimes. 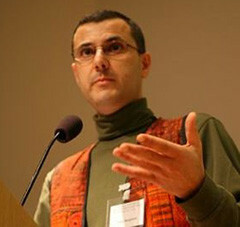 As one of the movement's leaders, Omar Barghouti, candidly admitted: "The end of the occupation is not the end of our struggle." Paradoxically, Barghouti is a student at Tel Aviv University, the same university he wishes to have boycotted. A vast and intricate network of NGOs, funded by the European Union and individual European states, is busy fanning Palestinian and Arab rejectionism, whether through the promotion of "the right of return," support for the BDS campaign, or discouragement of acceptance of Israel. Not all members of this network are in contact with one another, nor do they necessarily share the same specific goals. Yet they are unified by principled and ideological opposition to the two-state solution, and by implication—to Israel's very existence. Should Israeli lawmakers be faulted for trying to resist this trend? This has also applied to the wider conflict between Israel and the Arab states. See Gunnar Heinsohn and Daniel Pipes, "Arab-Israeli Fatalities Rank 49th," FrontPage Magazine, Oct. 8, 2007. "Infant Mortality Rate," The World Factbook 2011, Central Intelligence Agency (CIA), McLean, Va., accessed Feb. 8, 2011. "Life Expectancy at Birth," The World Factbook 2011, CIA, accessed Feb. 8, 2011. "Internet Users," The World Factbook 2011, CIA, accessed Feb. 8, 2011. "Violence and Left in Dark Times: Bernard-Henri-Levy and Slavoj Žižek," Intelligence2: The World of Debate, Sept. 16, 2008. Steven J. Rosen, "The Arab Lobby: The European Component," Middle East Quarterly, Fall 2010, pp. 17-32. The Jerusalem Post, Jan. 24, 2011; see, also, Saeb Erekat, "The Returning Issue of Palestine's Refugees," The Guardian (London), Dec. 10, 2010. Ha'aretz (Tel Aviv), Jan. 24, 2011. See, for instance, Bat Ye'or, "Delegitimizing the Jewish State," Middle East Quarterly, Winter 2011, pp. 3-14. It was only on January 26, 2011, after Mu'ammar al-Qadhafi had been slaughtering his subjects in full view of the world for some time, that Libya was expelled from the U.N. Human Rights Council. Gerald M. Steinberg, "NGOs Make War on Israel," Middle East Quarterly, Summer 2004, pp. 13-25. "Adalah," NGO Monitor, Jerusalem, accessed Feb. 8, 2011. "About Mossawa," Mossawa, Haifa, accessed Feb. 8, 2011. Jeff Halper, "A Just Street or Apartheid?" Counterpunch, May 3, 2007; YouTube, "Peace in the Middle East: Jeff Halper speaks at UCI, Part 3 of 8," accessed Feb. 9, 2011. "Why BDS?" The Israeli Committee against House Demolition, Jerusalem, accessed Feb. 9, 2011; "Projects: Home Demolitions and the Law," Delegation of the European Union to Israel, Ramat Gan, accessed Feb. 9, 2011. "Vragen en Antwoorden over Partnerorganisatie Electronic Intifada," Interchurch Organisation for Development Cooperation (ICCO), Utrecht, Netherlands, accessed Feb. 9, 2011. Ali Abunimah, "Why Israel Won't Survive," The Electronic Intifada, Jan. 19, 2009; "One Country: A New Book from EI Cofounder Ali Abunimah," The Electronic Intifada, accessed Feb. 9, 2011. "Donors for 2005/2006," al-Haq, Ramallah, accessed Feb. 9, 2011. "A Joint Open Letter to the Member States of the UN General Assembly from Palestinian Human Rights Organizations," al-Haq, Ramallah, Oct. 1, 2009. "Human Rights and Good Governance Secretariat (HR/GG) NGO Grant Recipients 2010-2012," NGO Development Center, Ramallah and al-Rimal, Gaza, accessed Feb. 9, 2011; "Donors," idem, accessed Feb. 9, 2011. "Palestinian United Call for BDS against Israel," Palestinian BDS National Committee, July 9, 2005. "Boycott Divestment Sanction Israel," YouTube, accessed Feb. 9, 2011. "Overview of European Governmental Funding for NGOs," NGO Monitor, Jerusalem, June 10, 2010. Related Topics: Arab-Israel conflict & diplomacy, Israel & Zionism | Ben-Dror Yemini | Spring 2011 MEQ receive the latest by email: subscribe to the free mef mailing list This text may be reposted or forwarded so long as it is presented as an integral whole with complete and accurate information provided about its author, date, place of publication, and original URL.